Picture it, late Saturday night, a smokey bar in the quiet part of town. An FM2n is sitting at the bar nursing her third martini. Up saunters a rather smooth talking FE2. He shows off his TTL flash control. The FM2n is unimpressed. He shows off his aperture-priority stepless shutter. She mutters something about only working with batteries. He responds that he has mechanical control at 1/125 sec. She says that all speeds are important, depending on the mood. 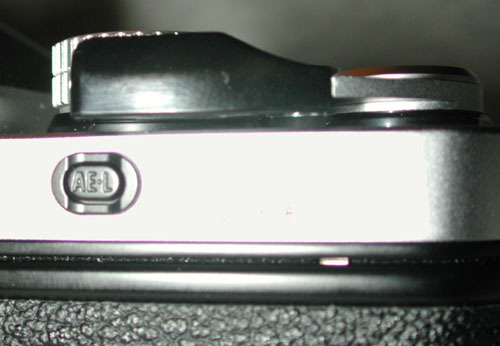 The FE2 boasts that he has a 93% viewfinder coverage. She mutters that size doesn’t matter, especially since her viewfinder is the same size. He points out that their focusing screens are compatible, along with the diopter adjusters. The FM2n says that they are also compatible with the FA. He says that the FA is too stuck up with her AMP metering and PASM exposure modes. He also mentions that FA is probably too “high maintenance” for him. Apparently that struck the right tone with the FM2n, and she allowed him to buy her a drink. That was 1987. Since then FM2n and FE2 have had a wonderful relationship. They were married in 1992. In 1996, they decided it was time to have a child (her “biological clock” was ticking). In 2001, the world was introduced to FM3a (according to Dr. Benjamin Pepper — yes, his name really is Dr. Pepper — a 5 year incubation period is not uncommon, especially for manual focus cameras). And it was shortly after it’s birth that I bought one, and review it here. 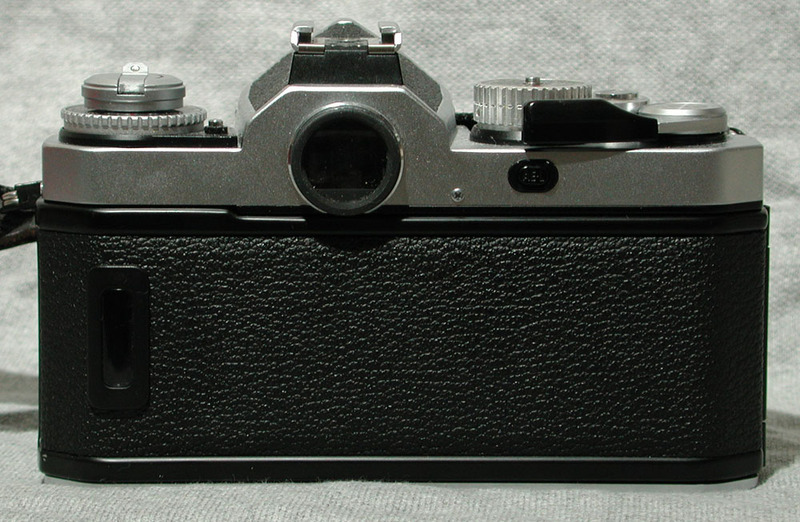 The FM3a is definitely a product of it’s parents. 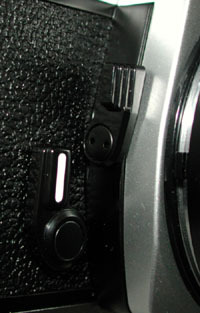 It has a hybrid controlled shutter. Mechanically controlled speeds from 1 sec. to 1/4000 (including bulb), but in aperture-priority mode, it has an electronically controlled shutter from 8 sec. to 1/4000. It has a flash sync of 1/250 and sports	TTL flash control. Of course, it has the classic 60/40 center weighted metering, a match-needle meter indicator, and don’t forget about an AEL button and exposure compensation. You can get all the technical details here. 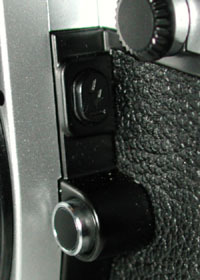 The FM3a retains the FM2n’s pseudo mirror lock up. You need to use the self timer mechanism. Once you set it and press the shutter button, the mirror flips up, then the count down begins. You can set the self timer to less than the full 10 seconds just by moving the self-timer lever to less than it’s full 90 degree position. 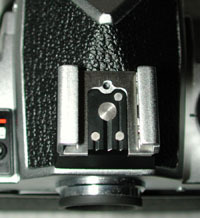 The FM3a also retains the depth of field preview lever. Press it, and the lens stops down to the aperture selected so you can check out your depth of field. After putting two rolls through the camera, I can definitely say that I prefer the match-needle meter indicator to the FM2n’s LED “+o-“ indicator. If I want to overexpose the scene by 1 stop, with the match-needle indicator of the FM3a, it’s easy to tell at a glance how much under or over I am from the meter’s “suggestion”. With the LED’s on the FM2n, you first have to get to the meter’s suggested exposure, then open up a stop. 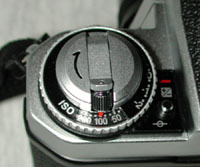 Having the meter indicator and the shutter speed indicator on the same side of the viewfinder is also an improvement over the FM2n. Instead of having to scan from the right side to the left to check the meter and the shutter speed indicator, it’s all on one side, again improving that “at-a-glance” thing. Also in the viewfinder is the flash ready and exposure compensation indicators. They are both easy to see. The flash ready indicator lights when the attached flash is ready to fire. If the flash was not powerful enough, it will blink three times after the exposure. The exposure comp indicator lights to let you know that exposure comp is being used. It doesn’t show how much, just that it is not set to 0. Aperture priority mode works just like it is supposed to. You move the shutter speed dial past 4000 to a green ‘A’, then select an aperture on the lens, and the camera selects the best shutter speed automatically. It shows you the shutter speed it will use by moving the needle on the left side of the viewfinder. 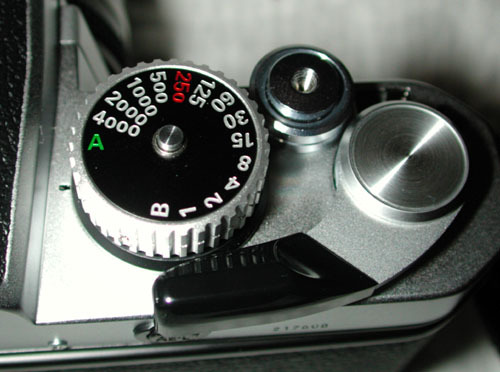 Once you move the shutter speed dial to ‘A’, it is locked there until you press the center button and move it to 4000. This is to insure you don’t accidentally get out of aperture priority mode and underexpose your entire roll (assuming you accidentally move the dial to 4000). The auto exposure lock (AEL) button is pretty handy. Obviously it is necessary for locking the exposure settings in aperture priority mode for recomposing, but it is also somewhat handy to fix a negative aspect of the camera (see below). Another feature Nikon had to include due to aperture priority is the exposure compensation dial. You can set +- 2EV in 1/3EV steps. You need to press down on the button and move the dial to the desired setting. It will stay that way until you set it back to 0. Pressing the button and moving the dial seems to take two hands. You can hold the button down with the thumb on your left hand and move the dial with your left hand, but only about 1/3 or 2/3 in either direction (which should OK for most situations). Any further than that, and you either have to repeat the procedure, or use your other hand. Your mileage may vary due to the size of your fingers. 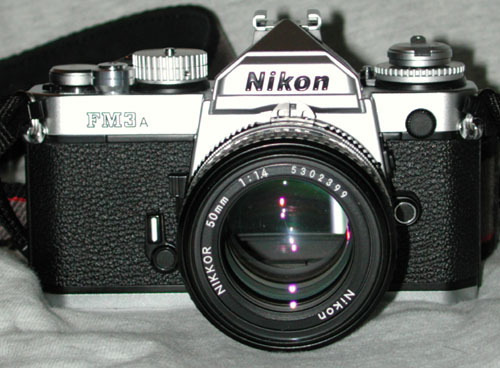 Another addition to the FM2n and FE2 is the ability for the camera to automatically set the film speed based on the DX code on the film cartridge. Of course, you can set the film speed manually as well in whole speeds as well as 1/3 speeds. 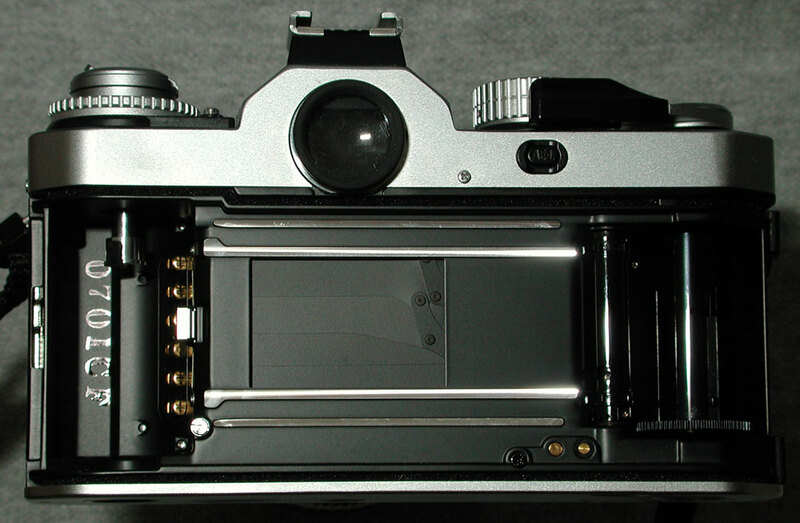 The back of the FM3a has a film window, instead of the film back holder of the FM2n. It is released by Nikon’s standard of pulling up on the rewind knob. The pressure plate is of the dimpled “waffle” style. This might be a problem for those who like to shoot Kodak HIE infrared film due to the lack of an anti-halation layer. 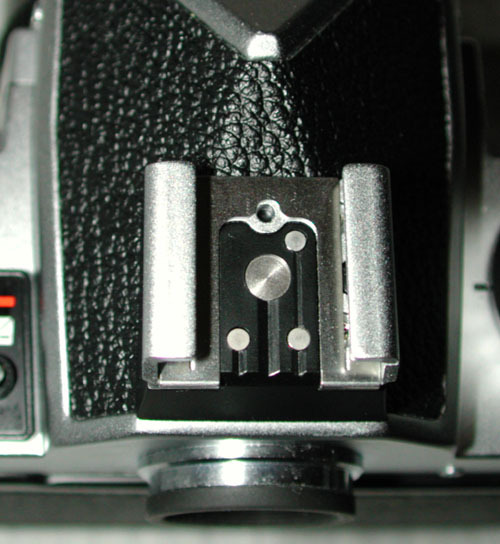 The FM3a uses good solid square metal rewind pegs. There is a row of gold DX contacts, and two gold contacts near the take-up spool for a data-back. TTL flash control has been added! They also added a neat button near the lens release button. It is a -1 flash compensation button. Hold it down while you take the shot, and it’s just like dialing in -1 stop of exposure comp. If you dial in -1 stop using the exposure comp dial, pressing the button will add (is ‘add’ the right word?) an additional -1 stop. When in aperture priority mode, the camera automatically sets 1/250 if a flash is detected. One thing I don’t like about the match-needle indicator of the FM3a compared to the LED’s of the FM2n is that while the indicator is off to the left side of the viewfinder, out of the viewfinders frame, it still uses the through-the-lens scene as a background. If you are looking at a dark object to the left of the frame (such as a tree) or if you are in a dark surrounding (nightclub), you will not be able to see the indicator. You can use the AEL button to lock the exposure and then move the viewfinder over something light colored, but that may not always be an option, and it is just darn inconvenient. Why Nikon couldn’t put the indicator against a white background is beyond me. Maybe some enterprising person on the Internet will figure out a way to “paint” the focusing screen with a wee bit of white out or something. If anyone wants to send me a K2 or K3 focusing screen, I’d be glad to try (nudge nudge, wink wink, know what I mean?). 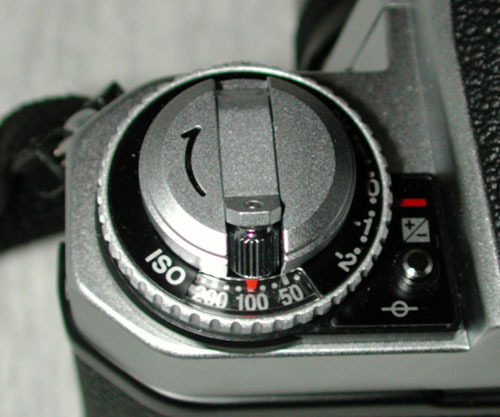 When in aperture-priority mode, the selected shutter speed the camera will use is indicated by the needle. This is only good for up to 1 second since the scale only goes to 1. In aperture priority mode, the shutter can go up to 8 seconds. There is an indication that it will be 2 seconds since the needle will go to the B (bulb), and it will go past the B for longer shutter speeds, but there is no way to tell whether it will be 3 seconds or 8 seconds. There is a big difference between 3 and 8 seconds when you are going for some blurring effects. The film speed dial can be a bit weird. If moving from larger numbers to small numbers (faster speeds to slower speeds), the “lock” positions are right on the little tick marks for the film speeds. When moving in the opposite direction, it’s sometimes a bit hard to tell which speed it is “locking” on as it seems to “lock” between tick marks. This is due to the fact that the dial moves a fraction of an inch to the left before moving the dial itself. To deal with this, I may have to overshoot a speed and then move back. Careless use on my part could result in 1/3 under/overexposure (not a problem with print film, but could be hazardous with slides).